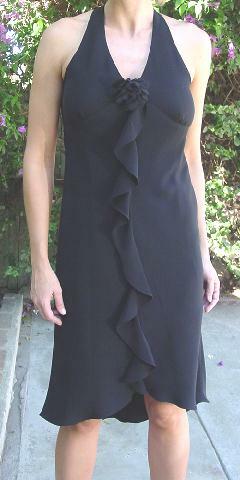 This black 100% polyester sleeveless dress is by Evan-Picone. 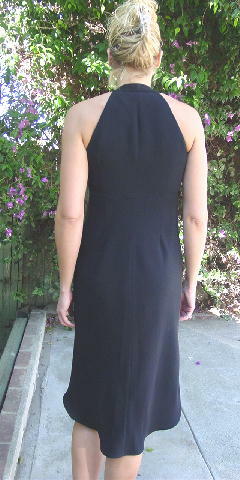 It has a 9 1/2" deep V neckline which gives the appearance that it has a halter styling from the front. There is an 8" left side zipper. At the base of the V is a fabric flower with a 3" wide fabric ruffle extending downward from below the flower to the front bottom hem. It has a full (feels like acetate) black lining. The front center is 7 1/4" shorter than the back. The tag says 8 petite, but it fits more like a 4/6 petite. 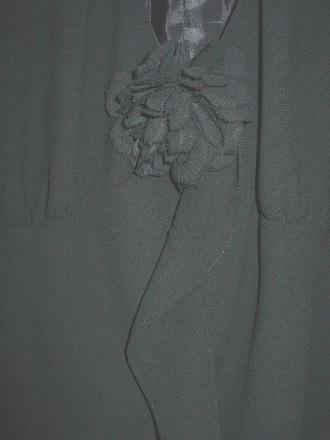 shoulder to bottom side hem 42 1/4"
shoulder to bottom back hem 46"